Designers, photographers, and artists are using Photoshop to create fantastic and realistic images for illustrations, fine art, and editorial content. Whether they're landscape or portrait photographers, illustrators or fine artists, masking and compositing are essential skills to master for combining images to the extent that it is impossible to tell where one image stops and the other one begins. 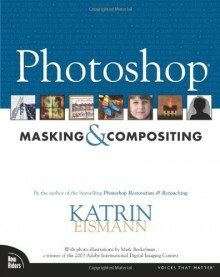 Photoshop artist and educator Katrin Eismann takes readers through numerous step-by-step examples, highlighting the tools and techniques used for masking and combining images. Featuring work by leading artists and photographers, this book focuses on the techniques used to create compelling compositions, including making fast and accurate selections, mastering Photoshop's masking tools, and implementing the concept and photography from start to finish. The book addresses working with Photoshop's selection tools; selecting and maintaining fine details and edges; working with difficult image elements, such as cloth, hair, or translucent objects; and green-screen techniques. Katrin also addresses the creative aspects of image compositing, including how to start with a concept, plan and execute the photography, and seamlessly assemble the image. Combining technical direction and inspiration, this book will expand readers' imaginations, so they can fluidly and professionally create images with Photoshop.